so she was 93 years old on St Valentine's day. You would never believe she was 93 .... she has a better social life than I do!! Here is the card I made for her, I always aim to make a touchy feely card with plenty of texture and strong contrasting colours. Here it is opened up she won't mind everyone knowing how young she is!! I started with an 8"x8" card marked a vertical line vertically down centre of the front and by placing my spellbinder's die half on half off the mark I was able to cut a semi circle which when I folded the front back on itself gave me the circle feature for the front. I used beautiful new Papermania Parisienne Blue papers and decorated with flowers and butterflies from my crafty stash. 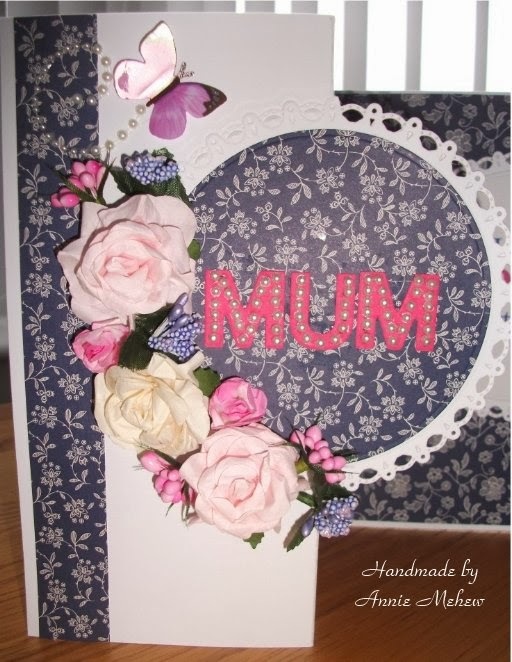 I diecut the word MUM and detailed it with some flat back pearls for texture. Of course Valentine's day has been and gone so she has already had this card, she assured me that she loved it. 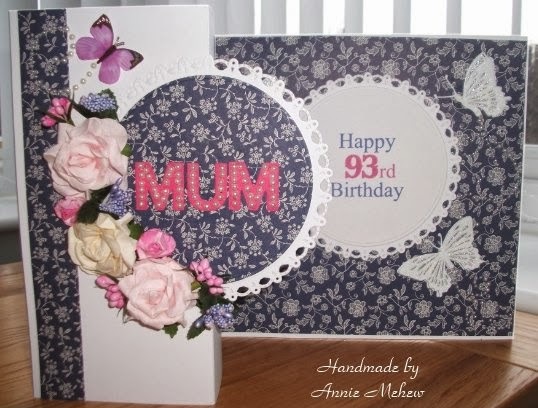 It's such a joy to make cards for her and she keeps each one that I have ever made for her so carefully. Well that is my offering for this Birthday Challenge, you can find more details about how you can enter over at : http://fussyandfancychallenge.blogspot.co.uk/ it is so easy to link your project to the blog and who knows you could be the one who is randomly chosen to win the prize this month, our sponsor this month is Crafty Sentiments. The Fussy and Fancy Girls love looking at your entries and leaving comments, whoever is hosting the challenge this month then has the difficult task of choosing her Top 5 entries. WOW Annie...your Mother-In-Law sounds FUN!!! 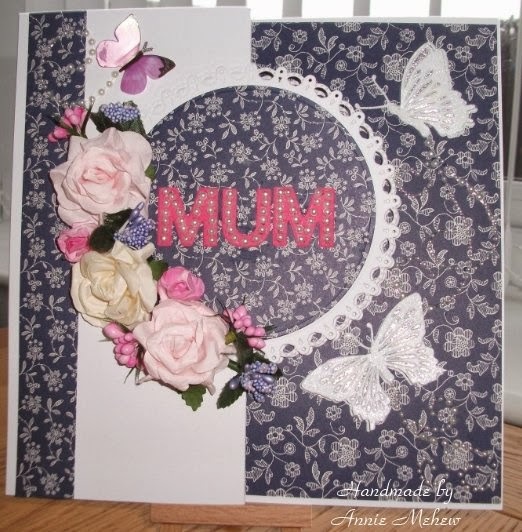 BEAUTIFULLY created card...so ELEGANT and LOVELY!! I'm sure that she just LOVED it!!! We here are crazy with birthdays also in the beginning months! !